Consider this your creative writing assignment for the day. The above image is the starting point for a story that you guys need to make up. Whoever reads and acts on this prompt first gets to start the story. The only rules are to pick up where the previous commenter left off and to keep it clean. I'll be back to check your work later. But, which one's should she choose? 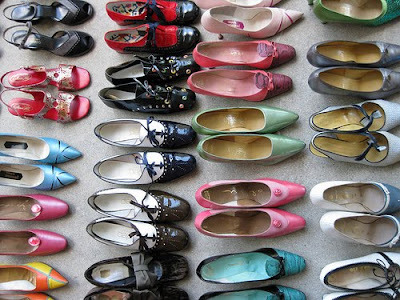 Flats, pumps, spats, shoes in every color. Finally, after hours of trying on two differnt shoes at atime, and standing on first one foot and then the other, squinting in the mirror, she decided. Pink. "Pink makes me brave," she said to herself. So with one pink shoe and one ruby slipper, she headed out the door. The shoes outshone Edward's sparkling skin, causing him to fall into a deep depression and collapse in a faint at Ella's feet. Ella tapped her heels 3 times, and he quickly arose. Before she could say anything, he vanished! "Maybe if I wore the teal ones......."
So she slid the teal ones on, and tied a matching ribbon in her hair. As she stood back and looked in the mirror, she felt positively about the color change, thinking aloud, "Teal is the perfect color for..."
(sorry for the re-post - fixing grammar - put this above Katy's!) "Your astonishing loveliness rendered me unconscious. I must tell you that teal is the perfect colour for a midnight picnic. Put on your pumps and let's get out of here..."
...hurry out of bed! 10 o'clock! Why, she was late to work...oh my, which shoes to wear?? Without a moment to spare, Ella dressed and slipped on her favourite burgundy and salmon heels. "These are THE perfect match for my gorgeous new vintage dress and jewellry from Etsy", she mused to herself. She hoped that Elsie and Rachel would love them just as much as she did, and with that she set off for work, nervous but excited for her job interview with Red Velvet Art during lunch. for it's every crafty girls dream to be a part of the Red Velvet Girls. The crafting, the laughing, the planning, the bonding. She just had to get this job. ...she thought "this is it. Gather your courage, Ella, the time has come to shine!" She put a big smile on her face and pushed open the door. frog. Little did Ella know that the frog would someday be her prince charming..
on one hand, a teal shoe in the other . . .
hours later she woke up to find herself covered in a crocheted blanket and a tin squiggly pug puppy licking her face. She must have been dreaming again? What could be causing these insane daydreams? It seemed to her that she had narcolepsy of the cute dreaming world. ..and some sushi. The girls helped her to her feet. With a short sigh she said "Are you ready" and fell to the floor with a smile on her face. Upon her awakening she appologized for the dreamy narcolepsy! A sweet smile came from Elsie's face as looked at Rachel and said, "Aw but we love*love narcolepsy of the dreaming kind!" As they are all were heading out the door Holly grabbed a pillow..
"I think I need to do some shopping to sort this out" she thought. Just as she headed to her favorite store, she saw Bella running towards her! "they looked way cuter on me!!" Little did Ella know that her parents kept a secret from her for all these years. She had a twin sister named Bella and her real parents were Charlie and Renee, which were Bella's parents. The family she had known all her life adopted her because her real parents, Charlie and Renee, were having such trouble during their marriage that to spare having to split up two children, they gave away Ella to another loving family. They thought it was best that she never know the mess they were in. ...Ella felt Elsie, Rachel, Emma, and Holly tugging at her arm. She had suffered another narcoleptic episode! She awoke, realizing what had happened, and explained to the RVA girls that she suffered from Hyperexcitement-Induced Sleep Narcolepsy. The girls didn't mind one bit...they were dreamers themselves, they explained, and had a gorgeous vintage-filled fort set with all a crafty girl could want, just perfect for dreaming new dreams whenever she felt she must. ...all thanks to some inspiration from her pink heels, ruby red flats, teal pumps, and especially her pink and burgundy beauties. And as she lay snuggling in bed with her real-life handsome "prince" Edward after her first day at RVA, Ella began to drift off to sleep. "Aaaah, my gorgeous wardrobe full of the most amazing, pretty shoes in the whole wide world," Ella thought to herself..."what WOULD I do with out you?"